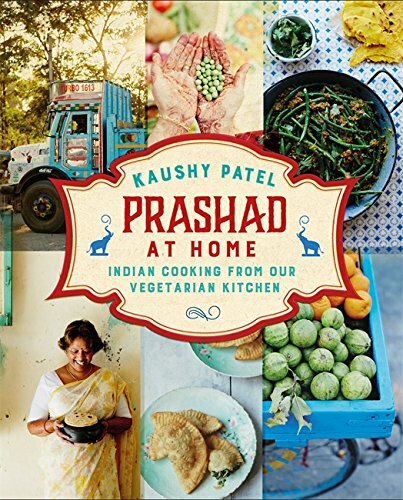 After the success of her first cookbook ‘Prashad Indian Vegetarian Cooking’ which is one of my most favourite cookbooks, Kaushy Patel’s second cookbook ‘Prashad at Home’ focuses on simple, quick and fuss free Indian cooking from her vegetarian kitchen. The recipes are little quicker and easier compared to the restaurant recipes from her first cookbook which will find its way into your dinner tables and hearts! The heart and soul of the cookbook remains the same, Gujarati inspired vegetarian Indian food with tantalising recipes which any home cook will find delightful to cook with easy to follow recipe instructions. There is a short introduction by the author Kaushy Patel in her own words mentioning the idea behind the cookbook with simple home food which is quite different from her previous cookbook showcasing the restaurant dishes. The recipes range from fuss free recipes to cook on weekdays to suit the busy lifestyle to elaborate dishes to enjoy in leisure to Indian fusion dishes. Kaushy emphasises on enjoying the cooking whether you have 20 minutes or 2 hours, bringing you and those you are cooking a great pleasure. Kayshy’s ‘Spice Tin and Seasonings’ contain the detailed guide to ingredients used in the cookbook and the ‘Practical Points’ shares top tips and how-to's into preparing and using the ingredients in cooking. Food is adaptable and it should suit you and your life, with all its unique demands. Cook what feels right whether that means knocking together something quick and easy on Tuesday evening, or spending a bit more time on indulgent celebratory feast. And be flexible: most of the recipes here are very forgiving. 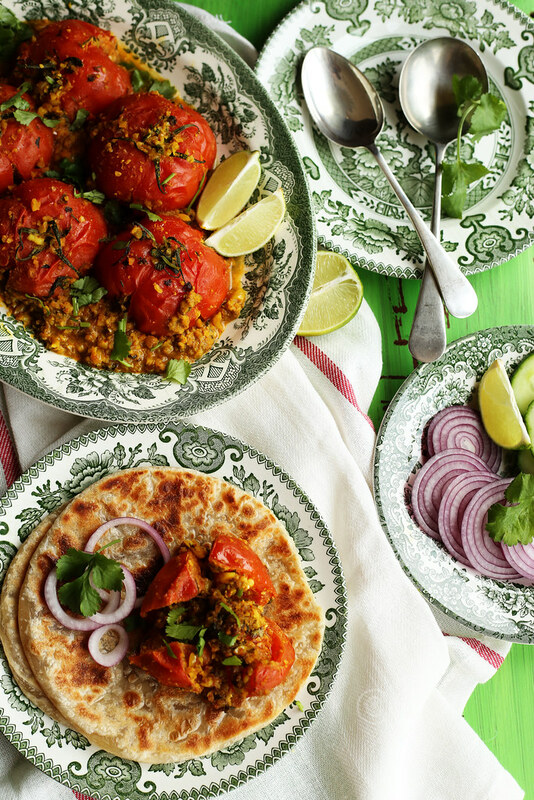 Prashad at Home has a collection of 106 recipes divided into 6 sections: Speedy suppers, Slow suppers, Light lunches and leftovers, Indian fusions, Feasts, festivities and sweets and All the extras. Around a dozen quick curry recipes, cabbage pancakes, couple of soup recipes and breakfast items like Upma and Sabudana kichidi are included in the Speedy Supper chapter with 19 recipes which can be on a busy weekdays when one is running short of time. You can leaf through the 18 recipes on the pages of Slow suppers when one is in a mood to cook and eat something little elaborate and still doesn’t want to slave over the stove. This section includes recipes for simple lentil or dal dishes to little complex dishes like Pav bhaji, Ragda patties, South Indian tiffin items like Uttappam and Idli-sambar and many more. Then comes a chapter of Light Lunches and Leftovers, where not all the recipes are super-speedy, but are sinfully delicious with 14 recipes for tantalising chaats (Indian street foods) like Bhel puri, Dabeli, Vada Pav, Tikki, deep fried vadas and many more! The next section on Indian Fusion with 19 recipes, my most favourite part of the cookbook, has some of the most loved Indo-Chinese recipes like Chilli paneer, Szechuan rice, Manchow soup, Hakka Noodles, Chinese bhel, Veg Manchurian and many more. Kaushy has also included other fusion recipes like Indo-Mexican Veggie enchilada, Spicy veg burger, Spicy veg pasties, Veggie pie and Indo-Italian dishes like Paneer ravioli, Mac and cheese, Veg lasagne, and Veg cannelloni. The next chapter of Feasts, Festivities and Sweets include 14 recipes from deep fried Chakri, Bombay mix, Bhakar vadi to time consuming recipes like Veg kofta, Dal bhati and churma, Dum biryani and Hyderabadi biryani. However, for people with sweet tooth will be little disappointed as it has only two sweet recipes to offer; Milk pudding and Sweet cardamom vermicelli. The final chapter All The Extras has in total 26 recipes from Indian flat breads like Makai roti, Palak puri, Methi bhakri, Roti and Bathura; rice dishes like Tomato pilau, Tuvar pilau, Jeera baath, Kichidi; Deep fried sides like Crispy bhindi fries, Masala chips, and Sticky chilli chips and an array of simple dips, pickles and relishes. 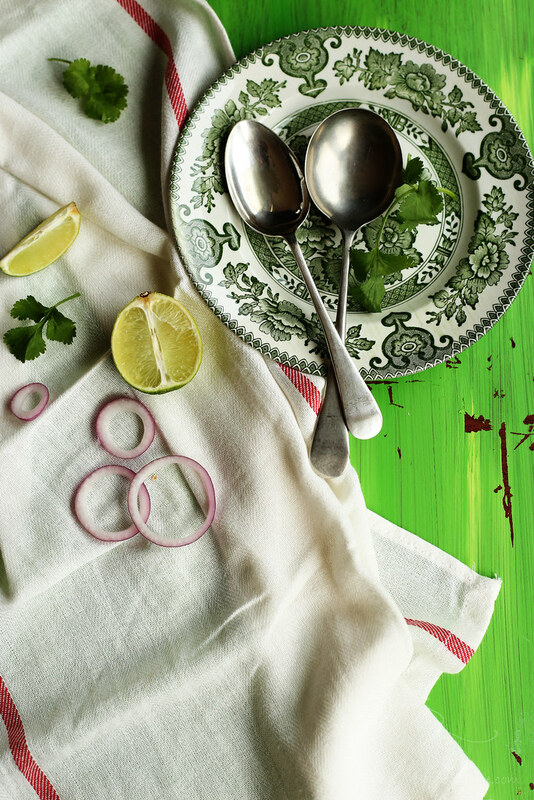 The collections of sumptuous recipes are beautifully enhanced by the food photographs of Matt Russell. 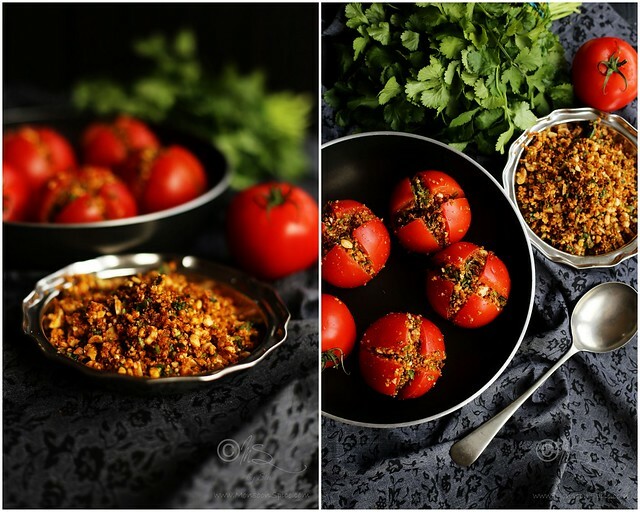 The retro styled photographs of Patel family's farmhouse in India with colourful street photography along with the gorgeous food photographs brings this cookbook alive. The short note to every recipe gives it an interesting background to each dish. The recipes are easy to follow for novices and expert cooks alike. This cookbook reflects the kind of Indian cookery that we know and follow in our Indian kitchen with fresh, locally sourced ingredients. Kaushy emphasises on using the fresh ingredients, like the freshly ground masala with fresh ginger and green chillies, which make a huge difference to the aroma and flavour of the dish. Now coming to the tricky bit of the review, criticism! A review is meant to contain at least some minor criticisms, isn’t it? Well, what can I say?! If I have to be really picky, it would certainly help to include the total time taken to cook every dish. I've already tried around 9 recipes from this book since I received it last month and based on the reaction from the people who have tasted these dishes, I know for sure that most of them will be featured regularly on our diner tables for years to come. 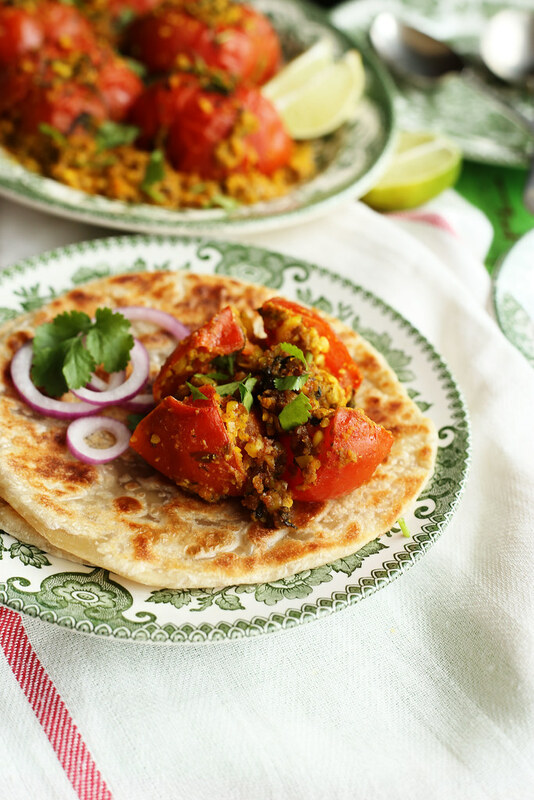 One of the greatest things about Gujarati food is that you can get huge amounts of flavour, taste and texture from some very simple ingredients. It is endlessly versatile and you can cook delicious dishes from just a few basic items in your store. 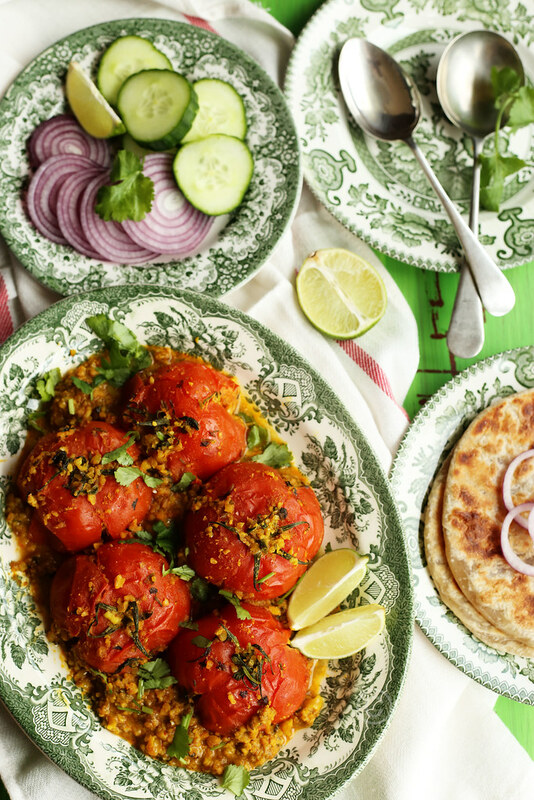 Kaushy’s ‘Prashad at Home’ is simple, inventive and soulful. Whether it is a quick family supper, lunch for surprise visitors, a celebratory feast or a cheeky snack on the side, there is something in it for everyone. Kaushy’s passion for Indian vegetarian cuisine and love for Indian heritage combined with her talent for cooking and teaching makes this book quite special. 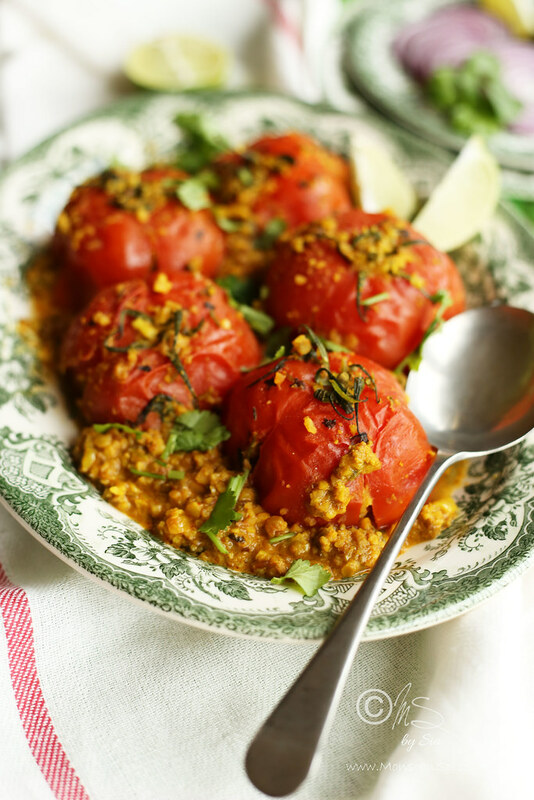 Today I am sharing the recipe of Tameta Reveya or Stuffed Tomato Curry, a simple recipe of spicy peanut stuffed vine tomato satay from the cookbook which has become a firm family favourite. This sweet and spicy satay is Kaushy’s own creation and demonstrates how easy it is to elevate everyday ingredients into something extraordinary by carefully balancing the spices. This recipe is quite similar to the Renghan Reveya (spicy peanut paste stuffed baby eggplants/aubergine) and Kehra na Reveya (Stuffed green banana satay), two winning recipes from Kaushy. 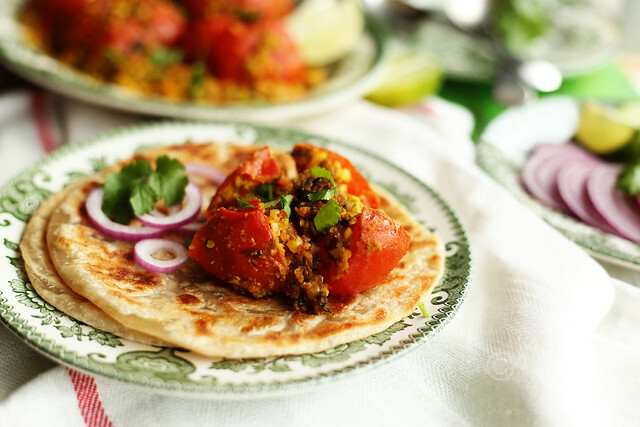 Use firm and juicy tomatoes, like vine tomatoes for the best tasting Stuffed Tomato Curry. Try not to skip making the fresh paste of ground ginger, garlic, and green chilli and be generous with the fresh coriander leaves as it makes a huge difference to flavour. 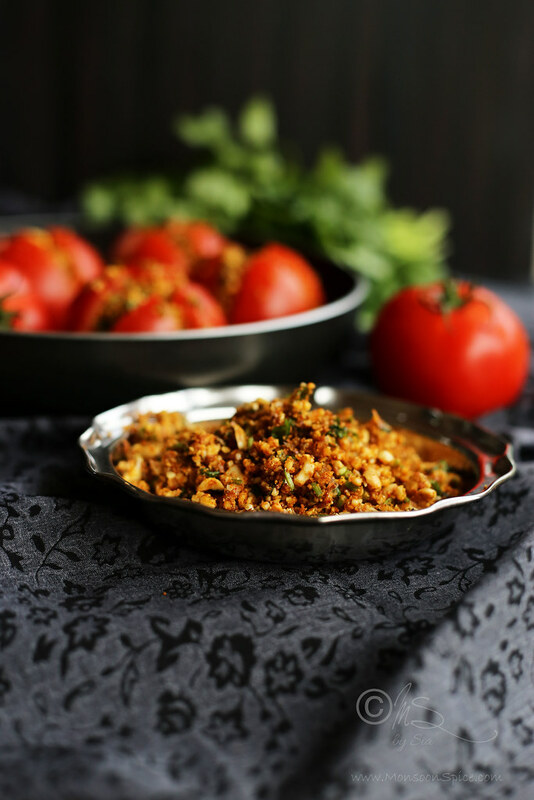 The crunch from peanuts, sweet and tart juice of the tomatoes, the peppery taste of coriander leaves are perfectly blended with the harmonious blend of spices. 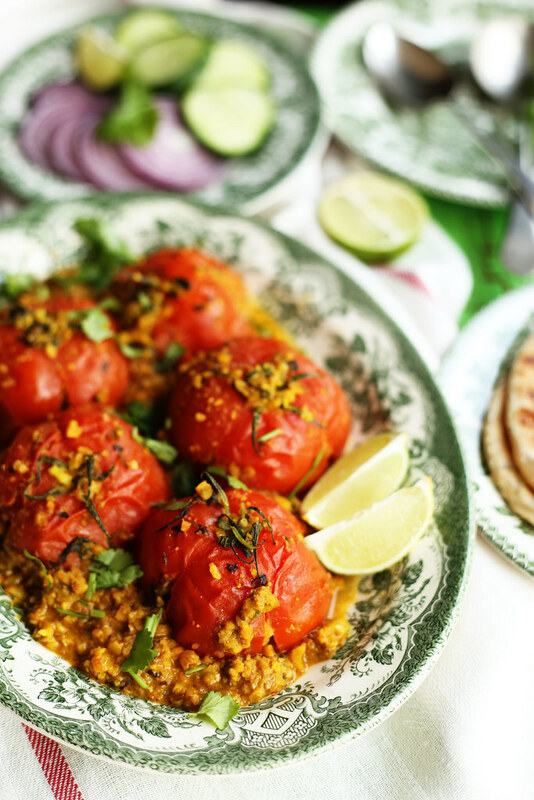 This simple Tameta Reveya or Stuffed Tomato Curry is easy to put together and takes under 30 minutes to cook from start to finish. 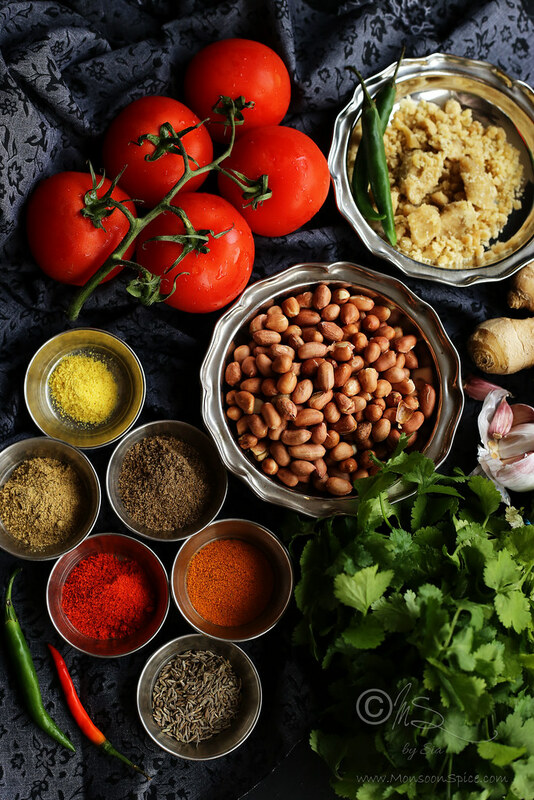 Just make sure that your Indian pantry is nicely stocked with the spices and ingredients listed below in the recipe and you will end up cooking this again and again for your loved ones. My little boy who is not very fond of tomatoes also took a second helping and that for me is a testimony for how good this Stuffed Tomato Curry is! Crush ginger, garlic and green chillies with a pinch of salt to fine paste using pestle and mortar. Mix the ground masala paste with coarsely ground peanuts, coriander powder, cumin powder, turmeric, chilli powder, hing, cumin seeds, jaggery, finely chopped coriander leaves and salt. Pour the oil and using hands mix everything through. While mixing the marinade, the jaggery will start to melt and create spice infused pockets. Leave to rest for 5 minutes for the flavours to develop. While the marinade is resting, prepare the tomatoes for stuffing. Partially cut the tomatoes into quarters from the base, leaving an inch at the stem end so that the tomatoes hold together. Gently prise them open and stuff them with generous quantity of marinade. Make sure to spread the marinade right to the end of incisions but take care not to overfill them, as the tomatoes may split apart completely. This process ensures that the marinade fully infuses the tomatoes during cooking. During this process if some of the tomatoes split or break, spread the marinade on the cut side before adding to the pan. Keep aside any leftover marinade. 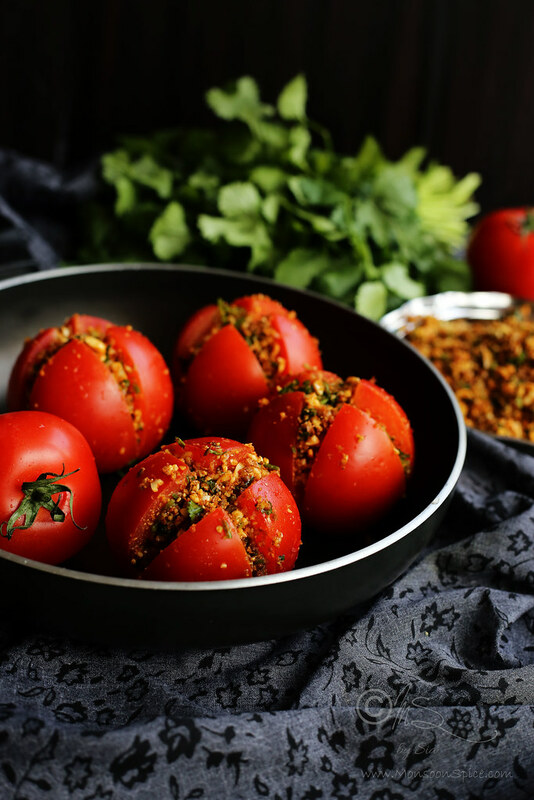 Arrange the stuffed tomatoes in a single layer in a large pan facing up. Drop any remaining marinade evenly between the tomatoes. Place the pan on the hob and switch on the gas on medium heat. Wash the marinade off from your hand and into the marinade bowl using about 1 - 1½ cups of hot water. Scrape all the marinade from the sides of the bowl, making sure you don’t waste any of the marinade. Gently pour this diluted marinade water into the pan between the tomatoes. Cover the pan and let it cook undisturbed on medium flame for 5 minutes. Very gently turn the tomatoes, then cover the pan and let it cook for a further 10 minutes. Take the pan off the heat and let it rest for 10 minutes to allow the flavours to develop. 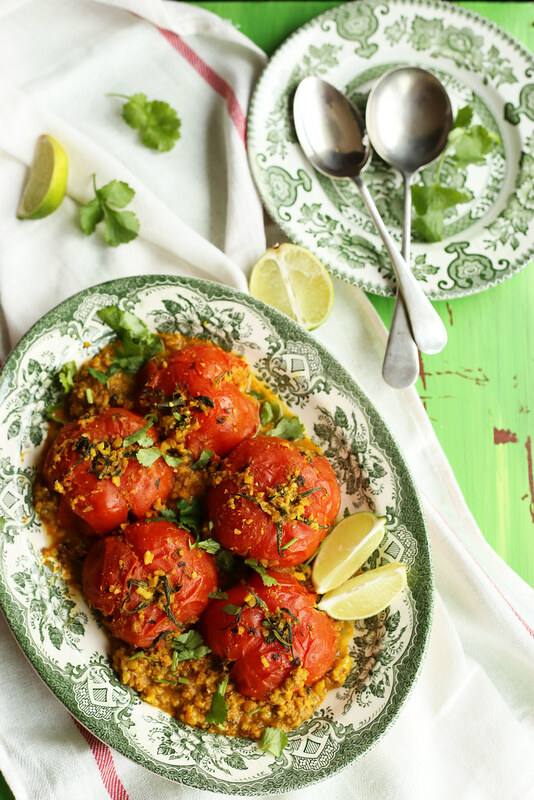 Serve this delicious Tamate Reveya or Stuffed Tomato Curry hot garnished with finely chopped coriander leaves with any Indian flat breads or simple flavoured Basmati rice like Jeera Rice. Enjoy! 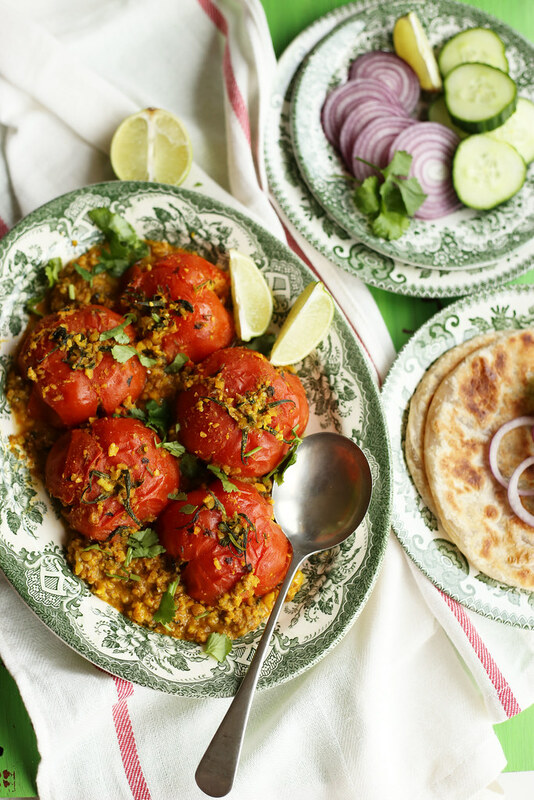 Use firm and juicy tomatoes, like vine tomatoes for the best tasting Stuffed Tomato Curry. Try not to skip making the fresh paste of ground ginger, garlic, and green chilli and be generous with the fresh coriander leaves as it makes a huge difference to flavour. During this process if some of the tomatoes split or break, spread the marinade on the cut side before adding to the pan. 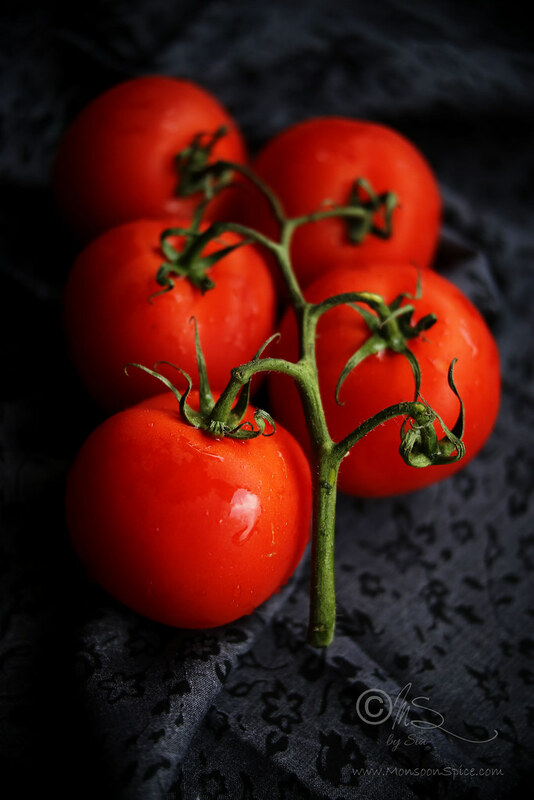 During the cooking process the tomatoes do break down and fall apart. 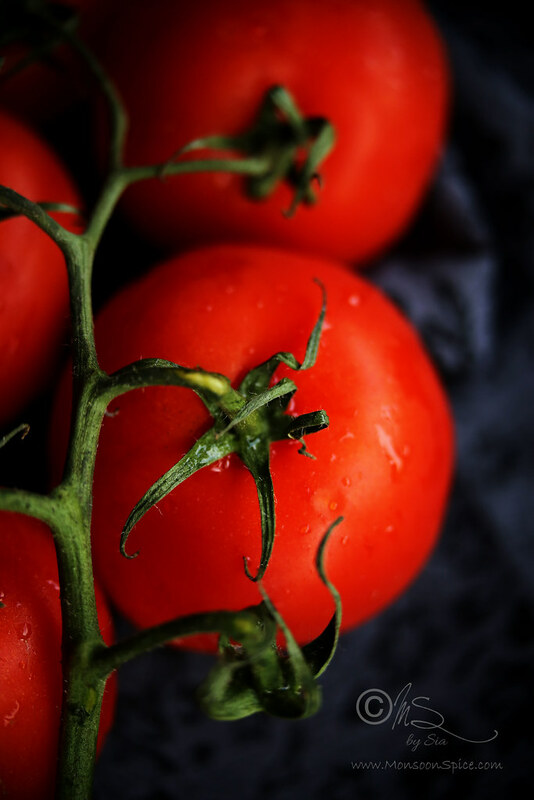 So you may wonder why we have been so careful with the tomatoes throughout the process, from cutting them to stuffing and carefully cooking them. It is mainly because this slow breakdown allows them the marinade to work its magic, adding a wonderful and rich taste. You can use baby eggplants/aubergine or bhindi in place of tomatoes using the same marinade or stuffing. Please note that the cooking time will vary for different vegetables. A beautiful dish! Really unique and surely mighty delicious. Looks delicious :-) Will try to cook these as soon as I can get my hands on some nice juicy tomatoes again. Thanks for the recipe! Thank you! Please do share a feedback when you try this recipe. Made these delicious tomatoes the other day for a going away party here in MEXICO. Everyone loved them. Used less water than suggested and the sauce was just the right consistency. Thanx so much. They have become a favorite recipe of mine!